The Research and Business Development Center (RBDC) stopped paying for project management software because it was clunky and did not integrate well with other applications, but most importantly, it was not intuitive for our workforce. As a result, our primary workforce of short-term, millennial interns, did not use the software, despite the many hours we spent training them on it. Instead, they used what they were used to- primarily Google Suite. We realized we were spending money on something that no one wanted to use. Instead of fighting against what our interns wanted to use, we decided to utilize it for ourselves- we embraced Google. 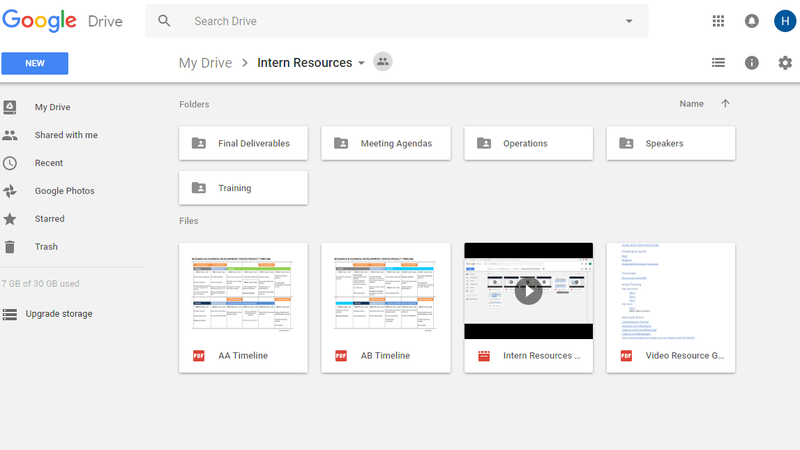 The RBDC created individual project folders within Google Drive for each consulting project, adding the intern team, project manager, and business director to those folders. Teams organize, tweak and adjust folders according to their needs. The RBDC also uses Google Drive to organize and share training materials and other resources. An example is illustrated in the photo below. Because of the interns’ familiarity with and the intuitiveness of Google, the drive requires very little training. There are some limits to using Google Drive though, like storage space and permission settings. Our interns rely heavily on the collaborative abilities of Google Applications as they write reports and organize presentations. 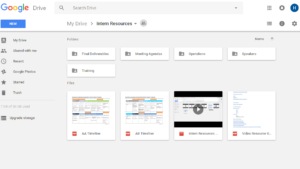 Google Applications are more intuitive than Microsoft One Drive, however, Microsoft Office offers many tools our interns need that Google Docs or Sheets do not. Additionally, Google Slides do not transfer well to PowerPoint. 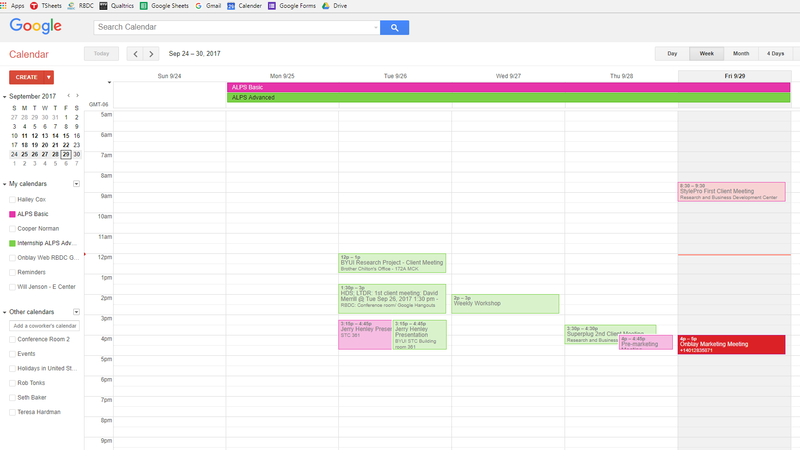 We utilize Google Calendar to schedule all internship, project management, and client meetings. This allows everyone in the program to stay on the same page and prevents double booking or other such issues. We find that it requires a medium amount of training to get our interns using Google Calendar correctly; there is, however, a lot of free training available online. Slack is not necessarily familiar to our workforce, but it is extremely intuitive. We find it takes minimal training to onboard our interns to Slack and there is a plethora of free training accessible online. Slack integrates well with Google and other applications. It provides one space for all program communication to occur and is indispensable to our organization. Slack is one of our strongest project management tools. It enables us to see all the conversation taking place between a team. That oversight allows a project manager to interject with suggestions or corrections saving everyone time. Project managers can also quickly review documents, answer questions, and solve problems.